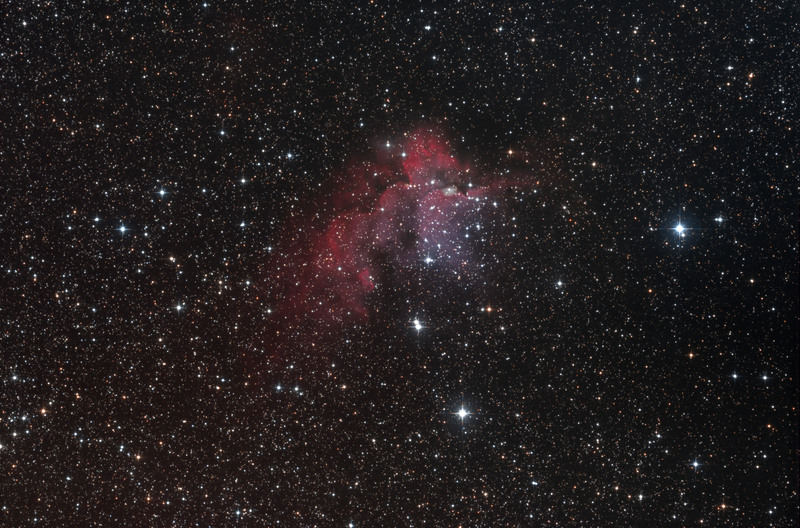 This faint emission nebula in the constellation of Cepheus is called The Wizard Nebula. The object called as The Wizard Nebula consists of an open cluster of very young stars, an emission nebula from which the star cluster was formed and patches of molecular clouds appearing as dark areas in the picture in front of the shining nebula. The open cluster was discovered in 1787 by William Herschel's sister Caroline Herschel and got #19 in her private list of deep-sky objects. William Herschel also included the cluster in his catalogue, just like other objects discovered by his sister. In the NGC catalogue, the cluster is identified as NGC 7380. They both have missed to spot the nebulosity around the stars, perhaps due to the bad reflectivity of the mirrors of their time. The nebulosity around the stars was catalogued by Steward Sharpless in 1959 as Sh2-142. Unfortunately the distance of the cluster and the nebula can't be determined accurately. Distance measurement methods are based on comparing absolute luminosity of stars to their apparent luminosity. The difference between these can be used to determine the distance, but in case of NGC 7380 the apparent luminosity can't be measured precisely, because various patches of interstellar gas and molecular clouds in the foreground affect the measurement. It is generally accepted though that the cluster is about 7500-8500 light years away from us, and is located in the Perseus arm of the Galaxy. Radial velocities of the stars and the nebula are very similar, meaning that they are moving together. The cluster contains about 100-150 very young stars of apparent magnitude 9-13, born in a recent start formation period about 4-12 million years ago. Due to their age, they are still in pre main-sequence phase. The stars of NGC 7380 also seems to be part of the much larger stellar association called the Cepheus OB1. Stellar associations are large group of stars moving together in space, despite being gravitationally unbound, often they have other similarities, like spectral class, age, etc. In Cepheus OB1 the stars are in either O or B spectral class. Most of the stars in our galaxy are thought to be born in OB associations. The nebula from which the stars of the cluster formed spans about 70x140 light years and contains about 4000 solar masses of gas, mostly hydrogen. Its red glow is due to ionising radiation from hot stars nearby, the most radiation is emitted by the eclipsing binary star DH Cephei. The cloud is evolved from a molecular cloud complex, the NGC 7380E, containing about 6-15000 solar masses.